In the Late Middle Ages, the Mongol Empire brought peace to most of Asia, and encouraged trade along the Silk Road. Poland, Russia, and Italy profited from this trade. Europe was making more and more stuff to sell on the Silk Road, especially wool cloth. By the early 1300s, however, the Mongol Empire was collapsing, and trade became much more difficult. 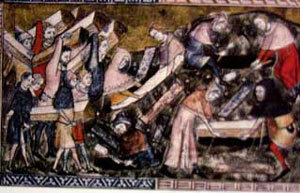 In addition, England and France began to fight the Hundred Years’ War, which made both England and France much poorer. Germany and Italy fought a long series of wars as well. All of these wars were made much worse by the Black Death, or bubonic plague, which spread along the Silk Road from China to Europe starting in 1328, killing millions of people and causing the collapse of the Mongol Empire. By the 1400s, after the plague, Europe looked very different. The wars were over. The plague was mostly over. Europeans were now making and selling not just wool cloth but also paper, sugar, cotton, and steel. Europeans started to look for better places to grow sugar and cotton, with cheaper workers. And the end of the Silk Road forced traders to look for other ways to get things from China and India. Explorers were figuring out how to sail from Europe around Africa to China. 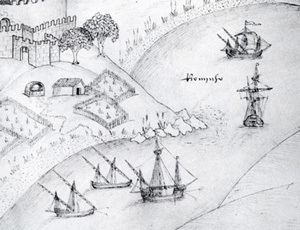 In 1453, the Ottomans conquered the last traces of the Roman Empire in Constantinople. In 1492, Spain forced the last Muslim rulers out of Granada (and the Jews). And in the same year, Columbus found the Caribbean: perfect for growing sugar and cotton. The Holy Roman Empire and Charlemagne in World History, by Jeff Sypeck (1997). An exciting and accurate account of the formation of one of Europe’s great empires. Beyond the Myth: The Story of Joan of Arc , by Polly Brooks (1999). Accurate and thoughtful, with good illustrations and maps, though more a biography than a history. Constantinople: The Forgotten Empire, by Isaac Asimov (1967). This book got many future Byzantinists started on their path. It’s out of print, but you can get it used. A Little History of the World, by E. H. Gombrich (2003). Written in 1935, the history is a little out of date, of course, but it is written to convey the facts of all of human history to young people, and I think it does a good job. Cite this page: Carr, K.E. Late Middle Ages – history of Europe. Quatr.us Study Guides, August 3, 2017. Web. April 25, 2019.